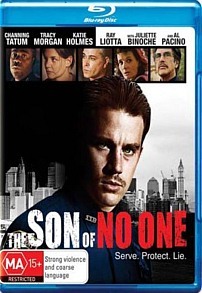 Son of No One Blu-ray Review. At the end of the day however a thriller of this sort is plot-driven, and the storyline, much like Channing Tatum’s unconvincing peach-fuzz moustache, just doesn’t pass muster. The third full-length feature from writer/director Dito Montiel and the follow up to Fighting, his solid 2009 ode to fisticuffs, Son of No One is a hardworking yet ultimately rather patchy thriller film whose impressive ensemble cast can do little but look helplessly on as a promising plot ultimately sinks like a stone. Having recouped the barest fraction of its $15 million budget and currently floundering in the Straight to Video ghetto, the unforgiving realm where movies both good and bad go to die, Son of No One revolves around cop, family man and all-around good guy Jonathan ‘Johnny’ White (Channing Tatum). Attempting to maintain some semblance of normalcy in spite of his hectic work schedule, sick child and decidedly grouchy missus (Katie Holmes), our protagonist, we soon discover, is hiding a terrible secret. Some 20 years ago when he was but a youngster there were a pair of murders committed in the project building where Little Johnny lived. Covered up for not altogether convincing reasons by a crooked cop (Al Pacino), the murders come back to haunt Big Johnny when a series of incriminating letters are leaked to an investigative journalist (Juliette Binoche). With the help of his police Captain (Ray Liotta) and a couple of gratuitous stylistic flourishes from Montiel, it will be all Big Johnny can do to ensure the impending scoop doesn’t destroy his life. Which is all fine, except that there’s only two people who could conceivably be sending the letters, both childhood witnesses of one of the murders, and the resulting denouement is more of a slight bend than a plot twist per se. The cast of notables put in almost uniformly strong performances, although Katie Holmes flounders about like a deer caught in the headlights and the greatest actor of his generation, or possibly ever, is largely wasted in his silly bit part. The real treats are 30 Rock’s Tracey Morgan, who wrings every ounce of gravitas from his small but affecting role, and newcomer Brian Gilbert who performs with equal adroitness during the numerous flashback sequences. At the end of the day however a thriller of this sort is plot-driven, and the storyline, much like Channing Tatum’s unconvincing peach-fuzz moustache, just doesn’t pass muster. A five-minute Behind the Scenes Featurette, and 11 Cast and Crew Interviews of varying length.